The new Injustice: Gods Among Us 1.06 patch has a lot of members in the fighting game community talking. One of them is Maximilian. Watch his patch breakdown inside. 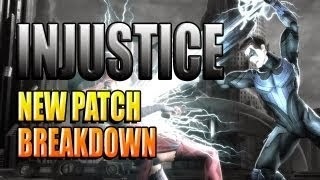 Taking a break from his slew of Killer Instinct videos, Maximilian has posted an Injustice: Gods Among Us 1.06 patch breakdown. Max goes over the general fixes and character balance changes made in the patch. If you would like to view a full list of the patch notes, click here.